Player of the Day—Strasburg struck out nine over 6 2/3 scoreless innings, allowing three hits and one walk, in the 4-0 win over the Mets. Here are the top 10 players in Box-Toppers points (BTP) for the 2019 season through the games of April 4. Strasburg earns 2.0 Box-Toppers points for being Player of the Day, his first points of the season, and ranks 13th in season player rankings. Strasburg has also now earned Box-Toppers points for 10 straight seasons. He earned his first points in 2010 with the Nationals and has 114.1 career points, 53rd among all players since 1995, when Box-Toppers tracking began. With his points Thursday, he passes four players on the “all-time” list—Sammy Sosa (113.2), Dan Haren (113.2), Chris Carpenter (113.3) and White Sox pitcher Ervin Santana (113.4). Strasburg now trails 52nd-ranked player, Giants pitcher Madison Bumgarner (114.4). Strasburg ranks eighth in career points among active National League pitchers. Strasburg’s best season was 2017 when he had 22.5 Box-Toppers points, fourth among all players and third among NL pitchers. He had one other season with more than 20 points—2012, when he had 20.4 points, third among all players and second among NL pitchers. He’s had four seasons with 15 or more points (2014—16.7, 2016—15.1, plus the two 20-point seasons). Strasburg barely kept the streak alive in 2011 when he had just 1.0 Box-Toppers point. In 2018, he had 6.7 points, his second worst season, ranking 51st among NL pitchers. His 15.8-point decline in 2018 from his 2017 point total of 22.5 was the second-biggest among all players. American League Player of the Day—Indians pitcher Trevor Bauer struck out eight over seven hitless and scoreless innings, allowing six walks, in the 4-1 win over the Blue Jays. Bauer was pulled after 117 pitches despite throwing a no-hitter. The Indians bullpen was not able to complete the combined no-hitter, giving up three hits. Bauer earns 1.7 Box-Toppers points for being AL Player of the Day, giving him 3.7 for the season, rising to lead season player rankings, passing previous leader, Blue Jays pitcher Matt Shoemaker. Though both Bauer and Shoemaker have 3.7 Box-Toppers points in 2019, Bauer ranks ahead because he had more 2018 Box-Toppers points (14.1 vs. 2.7). American League Batter of the Day—Stephen Piscotty of the Athletics hit a three-run homer and doubled, going 4-for-4, scoring once and driving in five runs, in the 7-3 win over the Red Sox. National League Batter of the Day—There is no separate NL Batter of the Day for Thursday because no NL batter earned Player of the Game honors. Streak—Shin-Soo Choo of the Rangers has now earned Box-Toppers points in 13 straight seasons after earning his first Player of the Game honor of 2019 Thursday. Choo (2B 2-3 2R 3BI in the 11-4 win over the Angels) earned his first point in 2007 with the Indians and has 61.2 career points, 11th among active AL batters. His best season was 2010 with the Indians, when he had 9.0 Box-Toppers points, seventh among AL batters. In 2018, he had 6.5 Box-Toppers points with the Rangers, sixth among AL designated hitters. 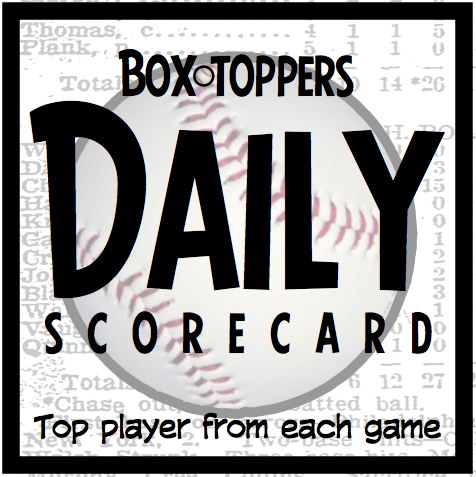 Scoring—Strasburg earns 2.0 Box-Toppers points for being Player of the Day and Bauer earns 1.7 points for being AL Player of the Day. Piscotty earns 1.5 points for being AL Batter of the Day. All of Thursday’s other Players of the Game (listed in the chart below) earn 1.0 Box-Toppers point. Player and team rankings—On most Fridays, we’ll post about the top 10 leading players in Box-Toppers points and provide team rankings reports. But usually, this early in the season with comparatively little data to provide based on only the first week’s worth of games, we will hold off until at least next Friday to provide a full report. However, as previously noted, Indians pitcher Trevor Bauer is leading Box-Toppers season player rankings with 3.7 Box-Toppers points. Plus, the Seattle Mariners currently lead all teams, with its players accumulating a combined 9.0 Box-Toppers points so far this season. The Milwaukee Brewers lead all NL teams, ranking second overall, with 7.5 Box-Toppers points.